Hamlet on the Couch weaves a close reading of Shakespeare’s Hamlet with a large variety of contemporary psychoanalytic and psychological theory, looking at the interplay of ideas between the two. Hamlet can be read almost as a psychoanalytic case study and be used to understand and illustrate a range of core psychoanalytic concepts. Covering such basic psychoanalytic concepts as identity, transference and countertransference, the ‘good-enough’ mother, the compulsion to repeat and the death instinct, James E. Groves shows how Hamlet can shed new light on understanding psychoanalytic theory, and how psychoanalysis can in turn enrich our understanding of Shakespeare’s work. Perhaps the most radical feature of psychoanalysis is its tradition of self-examination. Mirroring it, the book throughout uses an eclectic, subjective critical approach to study how the poetry of Hamlet creates its realistically flawed and believably complex characters. 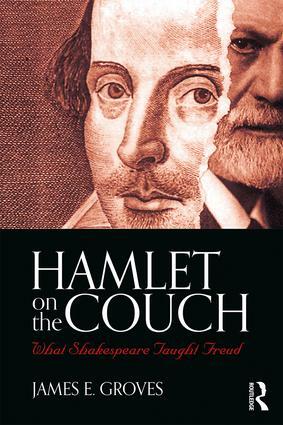 Combining deep, insightful knowledge of Shakespeare and of psychoanalysis, Hamlet on the Couch will be of great interest to psychoanalysts and psychoanalytic psychotherapists, as well as literary scholars. "This book is invigorating, sometimes infuriating, always interesting, often moving, and consistently well-informed- not a surprise given the author's background but a huge bonus for literary readers when Groves discusses psychoanalysis. It is a surprise as well as a bonus when he discusses not just Hamlet but also its critical tradition, including the textual arguments: he's far better informed than you would expect, better informed than most professional Shakespeareans. This book will focus and refocus people's thinking about the play on the psychological aspects of its characters, so central to its greatness, and which have been so neglected in recent sociological and historicizing criticism. Groves brings Shakespeare back to the psychological terrain which is his home, to the advantage of playwright and analyst alike. The writing is wonderful, full at once of style, brio, wit, and earnestness, a tough combo to pull off. Groves has learned much from his psychoanalytic heroes about caring for the experience of his interlocutor-in this case his readers- including their central experience of coming to understand. There's a lot to learn from this superb book; superb not least in the way it skilfully conveys its insights. "-William Flesch, Professor of English and Comparative Literature, Brandeis University. James E. Groves, MD, is a psychiatrist at Massachusetts General Hospital and Harvard Medical School. He practices psychotherapy, supervises psychiatry and psychology trainees on their psychodynamic cases, and offers tutorials in Literature and Psychiatry.